Summer is winding down, which means it’s time to shift focus to setting up our practices for a great fall and winter season. 2017 was a great year, and our hat goes off to all of you MassageBookers for blowing away the previous all-time record of income from appointments and gift certificate sales during the fall and the holidays. This year we want you to do even better. One of our main goals this year was to find new ways of increasing your income. While I’m not ready to let the cat out of the bag quite yet on the other items we’re working on, they should be out in the next two-ish months, and both should really help those who need more clients and to generate more income. As we roll through the back half of August, and as the kiddos go back to school, it's time to focus more attention on our practices again, yet don’t forget to take the occasional deep breath and appreciate the opportunity you have to improve the lives of the people you touch. ‘Cause that’s why we do what we do, right? Square Payments integration - full release! Square Payments integration - available to all! First off - a sincere and hearty “Thank you!” goes out to all the Beta testers who kindly volunteered to help us refine and improve the new Square integration over the last month or so. Thanks to their pioneering spirit, the rest of you will benefit from some enhancements suggested by early adopters. Given that the Square integration has been one of our most highly requested new features, you may already understand the benefits of what this brings to you. If you already use Square, you know that taking payments on a tablet or phone with their POS app is pretty slick. Not only that, but the signature screen does a very nice job of making it easy for clients to select a tip amount - resulting in more tip income. Add to this the ability to store client card info so you don't need to ask your regulars for a card each time, and you'll understand why this is so exciting. So how does the integration with MassageBook work? The Square app will automatically open and you'll just go through the normal Square flow. When the payment has been completed in the Square app, you'll automatically be taken back to MassageBook, where you can choose to send your client a receipt. The beauty of the integration is that all transactional details now live in one easy to reference place - MassageBook. Client details will include a full history and accounting of all appointments and payments made (including the details of all Square transactions), and sales reports will now include the specifics of each payment made as well. 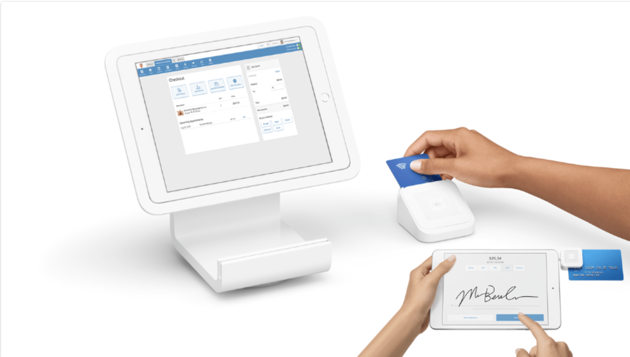 Works with all Square card readers and the very cool Square stand (shown in the image above), which works with iPads and can be purchased directly from Square's website. * Square processing fees are 2.75% per swipe, dip or tap. The same as their usual rates. Check out the help center section on all things Square here, give us a call, or email us! MassageBook has a really great email creation and sending feature. With a variety of great looking templates, and a simple 3 step approach to sending emails to only the clients you choose to, you'd think everyone would be using this proven way to generate more bookings. The fact is - when you send emails out regularly, you see clients come back more often. So we had this idea: What if we went ahead and pre-wrote a bunch of emails for you? So we started with three, and we'll expand the number in coming releases. You'll find that all three written templates are relevant to use now and through the fall. As always, we'd love to get your feedback and learn whether these written templates are helpful. If so, we'll be happy to add a bunch more so that you'll never have to stare at a blank page again trying to come up with new email copy. Have something specific in mind? We’d love to hear about that too!